For those who cannot attend, your donations are greatly appreciated and fully tax deductible. CHORRO ABAJO'S NEWLY BUILT LIBRARY! 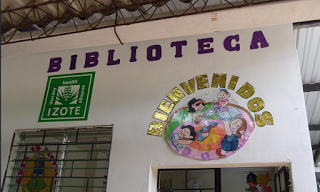 Chorro Abajo Primary School in Izalco, El Salvador, is transformed by the Izote sponsored library. May 21, 2015, Ribbon Cutting for the newly constructed library that had been housed in a corner of the principal's office at the onset! 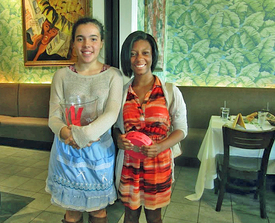 March 21st, 2015 4th Annual 'Night for Sight' Volcano Dinner Dance a Success! San Pedro Hospital Cataract Surgery Unit continues to thrive thanks to all our supporters! Izote team visits El Salvador in summer of 2014 to access our projects. We visited many active school libraries that were formed by Izote. Community library for children is opened by Izote working with local community leaders in Zacatecaluca. Izote provided all the equipment and instruments that have enabled Dr. Lopez to perform ophthalmic surgery for the first time at the hospital, which he is now doing on a year round basis. PAPA LOTA SCHOOL LIBRARY FROM TRAILER TO FINISH!